Already 55 years ago, the Organization of African States was born with the purpose of peace and unity in what is now the African Union (AU), the largest regional organization on earth. This year, the 32nd regular annual AU summit at Addis Ababa (10–11 February 2019) focuses on another distinguishing feature of the region, the continent’s enduring displacement and refugee crisis. The Summit’s theme “Refugees, Returnees and Internally Displaced Persons: Toward Durable Solutions to Forced Displacement in Africa” presumes a greater commitment to remedy. 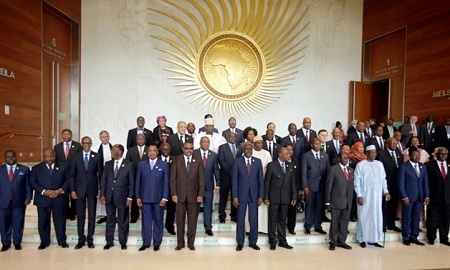 However, despite the progressive normative development in multistate commitments such as the Kampala Declaration, Great Lakes Protocol and African Commission outcomes, the current effort by AU heads of state may be too little and come too late in the crisis. In 2017, 15,000 people displaced every day inside African countries, while 2.7 million Africans were displaced by conflict, violence or disasters, without crossing an international border. In the first half of 2017, 997,000 new internal displacements due to conflict were reported in the Democratic Republic of the Congo (DRC), more than in the whole of the previous year, and 206,000 in the Central African Republic (CAR), four times the number in 2016. Across the African continent, members states and their governments bear direct responsibility for much of the population displacement and refugees situations in DRC, CAR, South Sudan, Burundi, in Morocco’s occupation of Western Sahara, for the crimes committed in Sudan’s Darfur State and forced eviction practiced in the context of “development” across the continent. Ethiopia is also a poignant venue for these deliberations, as a major author of development-induced displacement and population transfer, aided by the expertise and ODI of external accomplices in related crimes, including United Kingdom (DfID), United States (USAID), Israel, China and the World Bank directed by its member states. Population migrations in the continent count as 26% of the world’s total refugees and displaced persons. With political leaders setting the standard for destructive practices, nonstate actors have emulated violent state behavior. These have taken various manifestations in forms such as Boko Haram, Lord’s Resistance Army, al-Shabab, People`s Movement for the Liberation of Azawad and Libyan militias. Problem solving in the AU is characterized by serial crisis management, while prevention of the crisis of displacement and accountability for its causes seem more elusive. One innovative mechanism devised by the AU is African Risk Capacity (ARC), a specialized agency helping Member States since 2012 better to plan, prepare and respond to extreme weather events and other natural disasters, thereby protecting the food security and livelihoods of their most vulnerable populations. With ARC, the AU can respond to the growing impact of natural disasters and extreme weather events on the continent. In its first four years of operations, the ARC mobilized over US $36 million to countries in the Sahel and southern Africa to provide timely assistance for over 2.1 million people and 900,000 livestock affected by extreme droughts. In the field of displacement triggered by environmental events, the African Development Bank (AfDB) took the leadership to design the Africa Disaster Risk Financing Facility (ADRiFi). That program will expand AU Member States’ access to ARC’s risk transfer facilities. As crucial as these mechanisms are in addressing the challenges associated with the environmental causes of migration, the 32nd AU Summit appears silent on both prevention and liability for human-made shocks. While the Summit convenes, conflicts and violent repression in Sudan, Zimbabwe and Cameroon involve dispossession and further displacement, while crises involving refugee flows from Western Sahara, Central African Republic, Somalia and South Sudan persist. Each of these instances, featuring prominently in HLRN monitoring, Urgent Actions, Violation Database and Violation Impact Assessments testify to the political dimensions and personal responsibility of perpetrators of gross violations and crimes involving forced eviction, displacement and population transfer. While remedy to the current crisis meets the political will to invest tens of millions of dollars in relief, the cross-system approach calls for a more integrated approach that aligns with sustainable development and human right implementation, both for remedy and prevention. However, that holistic alternative requires the moral will on the part of the political leadership convened at Addis Ababa first to desist from the criminal practices and human rights violations that induce displacement across the continent. Liability also rest with many of those gathered there, as do the measures required for both reparation and prevention of further impoverishing displacement in Africa.